The police presence around the site was oppressive. Over 3 million pounds was spent on policing the camp. With officers shipped in from London and as far as Yorkshire. With constant searches, vans of riot police outside the gates, and helicopters over head, it was hard to forget that we had been deemed a “criminal element”. 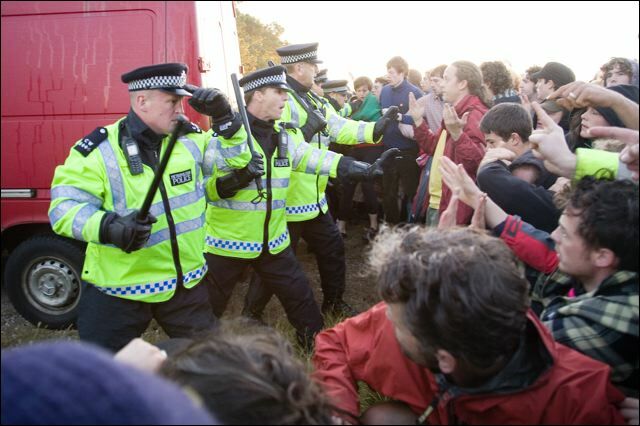 Climate camp is built on non-violent beliefs. Although campers may break the law in order to make their voices heard, it is always done in a non-violent fashion, and with respect for local people and their environment. Our everyday lives at the camp consisted of cooking, learning, building, and having fun, hardly justification for the 3 million spent on watching our every move. The camp has a police liason team. But conversations broke down quickly with both sides refusing to accept the terms offered by the other. 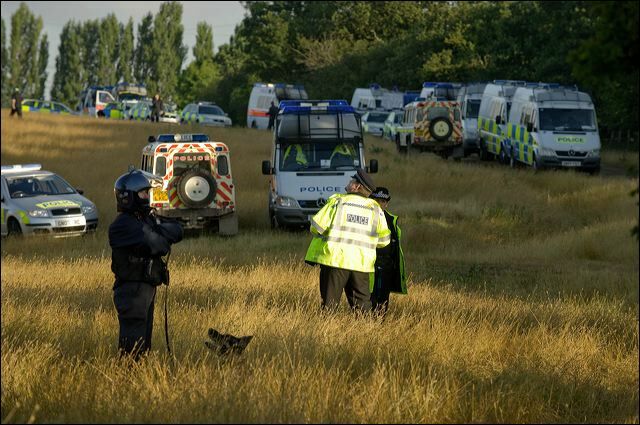 At the camp last year at heathrow, police were allowed on site every hour and were shown around the camp. This year Police refused this, demanding greater access to the camp, and because this was found unacceptable, the police therefore had no access at all. 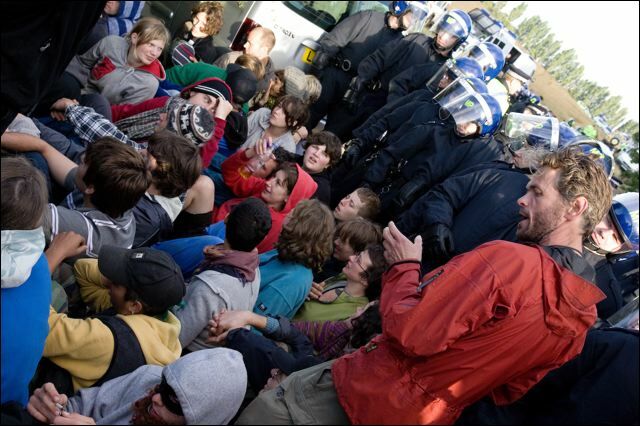 The police used a number of tactics to try to gain control over the camp. One of these was their early morning wake up calls. At 5.30am almost everyday, vans of riot police would begin to arrive at the main gates of the camp, and look like there were going to try to storm the camp, there would be a call out and campers woken up to help the defend the gate. We would appear bleary eyed, in pyjamas and sandals to protect the camp from rows of riot police kitted out with helmets, shields and batons. There was a team of police that used the opportunity to take our pictures, one after the next along the line. And then they would withdraw. It was believed to be a tactic to wear us down, interrupt the running of camp, and get our faces on film. The were a number of arrests during the week and on the day of action. Some arrestees were handled violently recieving kicks, punches, and even pepper spray in the eyes on arrest. There were police reports of finding knife stashes in nearby woods, and this was used to justify their treatment of the campers. However, as had been the case last year, the violent criminal element the police so fondly used to justify their presence at the camp, failed to materialize. This entry was posted on Saturday, August 23rd, 2008 at 8:24 am	and is filed under Climate Camp 2008. You can follow any responses to this entry through the RSS 2.0 feed. You can leave a response, or trackback from your own site.